Your nation has wound up with a glut of old 60-rated Leenex engines, originally meant for the Urbanmech . Desperate to fend off pirates and other potential attackers, your ruler has ordered you to design vehicles that make effective use of this unexpected windfall. - Unit must use a 60-rated Standard Fusion Engine. - All tech bases (IS, Clan, Primitive, Mixed) and unit types are allowed. - Unit creation date must be 2700 or later (late enough for there to be spare Urbie engines) but otherwise have no Era restrictions. 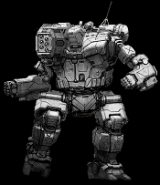 When one of the PR people over heard the design team laughing hysterically at the joke "I'm an Urbie too!" and after seeing it painted on several of the prototypes, the name of this wheeled vehicle was sealed, despite not being a mech at all. It's slow speed and giant cannon sort of fit with it's name anyway. Yes. In fact I was planning to do a similar thing in the Protomech board too, only with 45-rated engines allowed in addition to 60. I keep forgetting that hovers above 50 tons are even possible. An odd LRM carrier indeed. Heck with it, I may as well throw a few in here. I might write some fluff for them and put them with my Vaults stuff at some point, but the story itself takes priority. I used fractional accounting for both, so I could wedge in a tiny bit of extra stuff. Aren't hovers required to spend 20% of their mass on their engine? Here are three APCs based on the Leenex 60. All are OmniVehicles with the only differencecs being motive type and the hover having less armor than the other two. 1.5 tons of pod space. Here's a small attack VTOL on Omni frame. 3.0 tons of pod space. It does, but Solaris Armored Works doesn't note the extra tonnage in the output. Three simple tracked tanks using the same chassis. First the cityfighting mod A. Pro tip: don't get hit much! Lostech upgrades would be FFA for 20/11/10/10 or 20/11/11 armor, dropping the twin SLs on the B for a SPL, or switching the tripple MLs on the A for twin ERMLs, CASE and a RL/10. They have all the sinks they need. The first only needs nine, has ten. The second needs 10 and has 10. Missiles and ballistics don't count against heat. Mine's not really stated out, though I suppose I could go cobble some together. Anyway. In the campaign I'm in, we have a mobile power source for field bases and whatnot that we made by bolting the engine from an Urbie we gutted to the back of an old flatbed truck (which we may or may not have "commandeered") then kludging together some extra shielding and power hookups. We mostly built it because we didn't know what else to do with the Urbie wreckage. a) the "Coward", a 22-ton VTOL (speed 9/14) with 1 PPC, 3 tons of armor (16 front, 2 rotors, 10 rear & sides), 3 tons of cargo space; a jack-of-all trades vehicle that can serve as a spotter, sniper and/or troop carrier. b) the "Savannah King", a 12-ton Hovercraft (speed 12/18) with 3 medium lasers in the front, and 2.5 tons of armor (15 front, 10 sides, 5 rear). c) the "Amphisbena", a 50-ton tracked trailer pushed or pulled (at a speed of 1/2) by a 10-ton tracked tractor. The tractor has two hitches, 1 in the front and 1 in the back, and can unhitch the trailer to operate independently as a light tank, with a speed of 6/9, 3 medium lasers in the front and 3 tons of armor (20 front, 11 sides, 7 rear). The trailer can operate independently (although not move) thanks to a small ICE engine (rating:10); it has 1 hitch in the rear, 5 tons of armor (35 front, 15 turret, 10 sides and rear), twelve LRM5 launchers on a turret and 1 ammo bin carrying 10 tons of ammunition (a total of 240 shots, or 20 rounds at full firepower). In a battle, tractors will "park" trailers, ideally in a protected spot, unhitch and operate independently to provide cover against backstabbing units and/or spot for indirect fire. Cheap little bug zapper that can run on any airless moon you want to. 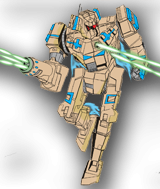 Fitted with a targeting computer to help the dual ER Medium Lasers swat anything equally small that get its attention.